Transferred from Air Ministry to Admiralty 01 January 1946 on loan. 01 January 1946 as H.M.S. 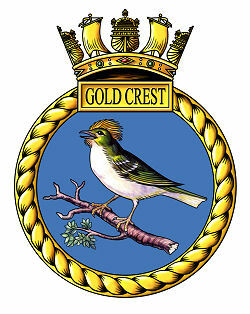 GOLDCREST II, satellite to R.N.A.S. Dale. 04 September 1952 as H.M.S. GOLDCREST. 31 March 1948 to Care and Maintenance Status as War Reserve. Reopened 1952. Transferred to R.A.F. control 01 March 1971. Working up of front-line squadrons and Armament Training Ranges. 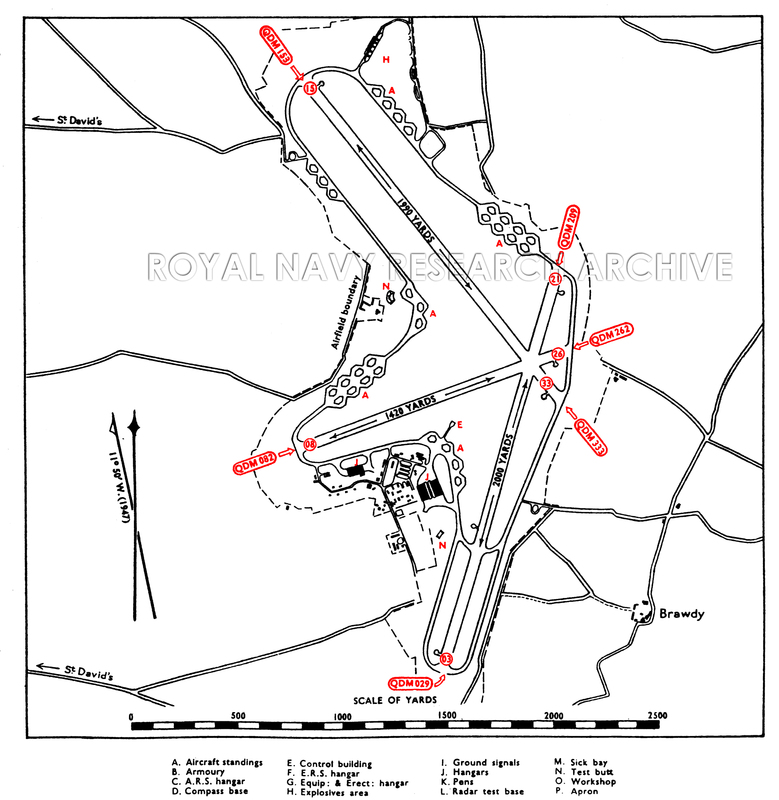 The airfield lies one mile inland from the NE. shores of St. Bride's Bay, and 7 miles ESE. of St. David's Head. 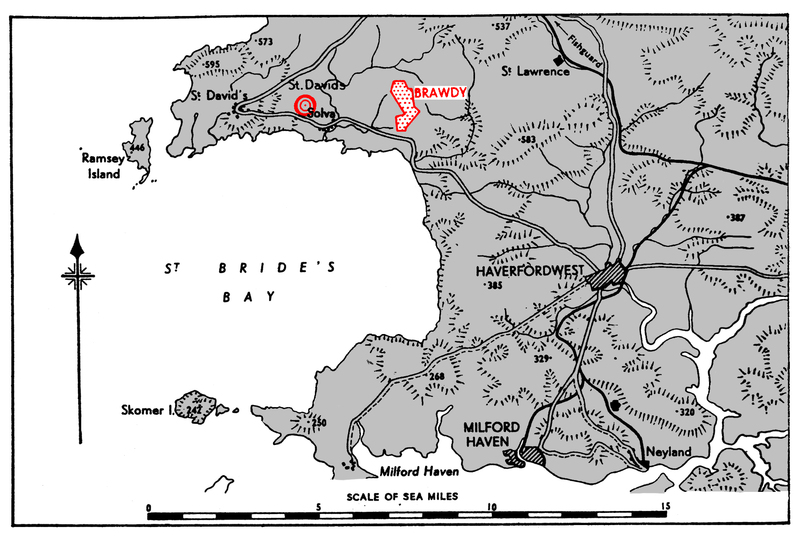 Haverfordwest lies 7 miles SE., and Fishguard 8½ miles NE. The village of Brawdy is adjacent SE. St. David's peninsula, with the town of St. David's and Ramsey I. W/T masts 3 miles E. and 4 miles ESE. of the airfield. Passenger and goods to Haverfordwest, W.R. Bus service from Haverfordwest to the airfield. Control Building inside perimeter track on W. side of airfield S of runway intersection. Three, concrete and woos chippings. W/T masts (725') 3 miles E. and W/T masts (580') 4 miles ESE. Recommended approach. sector. mean QDM. o4o° . Three. First 30 yards N. of Control Building, second on NW. boundary of airfield and third on SE. boundary of airfield. None. Post 1952 Identity beacon flashing BY (red). None. Post 1952 High intensity and Calvert type Approach Lighting on Runway '21. 'T' Approach Lighting on all runways. Sodium Flare path on runways 15 and 21. None. Post 1952 Mark V airfield lighting. Approach lighting as by day. None. Post 1952 GCA (AN/CPN4) Precision Approach on runway '21'. Search approach on all runways. Post 1952 HF only - 5 transmitters, 5 receivers. Post 1952 16 transmitters, 17 receivers, 2 Transceivers. 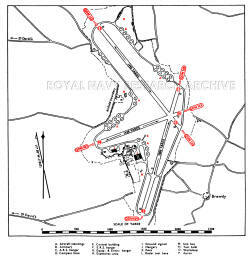 Post 1952 Aircraft direction using C.G.I. and Interrogator and Aircraft direction using low cover radar ser with Interrogator (provided by H.M.S. Harrier). AV/CPN4 Controlled approach. Living quarters in communal and dispersed sites. One. Diameter 80', power supplied. One main site SW. of runway intersection. 239' 7" x 113' 6"
83' 10" x 60' 3"
Sick bay in dispersed site W. of '08' end of runway 08/28. Office in Control Building. Full service by Naval personnel. AVGAS ... 12.000 gallons in one installation. AVCAT ... 20,000 gallons in two installations. 25 yards range for M.G. and Cannon. Post 1952 - None. None. Post 1952 - Limited squadron support. Visitors parking area on hard standing to rear of Control Building. Castlemartin. R/P Firing (Dummy heads), Practice Bombs and O.R.S. St. Bride's Bay. R/P Firing (Dummy heads), Strafing, Practice bombing. Operated Firefly I.NF, Hellcat II.NF. Harvard II.